If you are flying into Dubrovnik for your first holiday In Croatia and wish to spend the week travelling around, you have various options depending on the time of year you travel and the means of transportation you choose. Here is what I would consider as an optimal trip for a first time visitor. 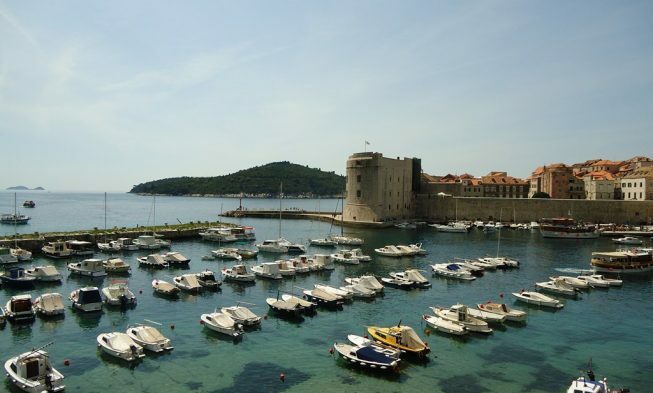 Start: Dubrovnik, you can either choose to stay one night in Dubrovnik or continue directly to Korcula. Travel options between Dubrovnik and Korcula are limited, so if possible, arrange your flight with the days where you have ferry or catamaran between the cities (usually a few times a week during the main season). If you can’t get your flight to match the ferry schedule, you have an option to travel by bus. If none of those options work for you and you don’t want to spend money on a private transfer, you should skip Korcula and go directly to Split – You can read about things to do in Dubrovnik here. Korcula (overnight stay): if you manage to get to Korcula, you will have no problem getting to Hvar as there is a daily catamaran connection between the cities – Here you can read about what to see and do in Korcula. Hvar (overnight stay): coming from Korcula you will arrive in Hvar town where you should focus on spending your time; what to see and do on Hvar you can read about here. Split (overnight stay): from Hvar town there are several daily catamaran connections to Split. There is also a regular ferry connection from the town Stari Grad on the island. What to see and do in Split you can read here. National park Plitvice: getting to Plitvice from Split is possible by bus or by a rented car. During the main season there are about 8-10 daily bus departures. Where to get out at Plitvice and where to enter the national park you can read here. Zagreb / Zadar (overnight stay): if you rent a car in Split, you should not necessarily go to Zagreb; in that case I would recommend you drive to Zadar and stay overnight and from there on then continue to Dubrovnik where you can return the car. If you travel by bus, you can either go to Zagreb and fly back to Dubrovnik from there or you could take a bus back to Dubrovnik which takes about 8-10 hours. End the trip with an overnight stay in Dubrovnik. As you probably have noticed, this itinerary has 5 travel days and 5 overnight stays which gives you the flexibility to squeeze in the two last nights in any of the spots. If you travel Dubrovnik – Korcula by ferry / catamaran (or bus), Korcula – Hvar by catamaran, Hvar – Split by catamaran, Split – Plitvice and Plitvice – Dubrovnik by public bus, you have a total cost of transportation of about 600 KN per person. If you rent a car from Split, you have a cost of about 300 kn till Split + cost of car rental, fuel and highway toll.